Many undergraduate students qualify for a combination of merit-based scholarships and need-based grants. Educational loans, alternative loans, on-campus employment, and payment plans are designed to fill in the gap. The Student Enrollment and Financial Services office will try to help you bridge the gap between the University’s costs and your ability to meet those costs. The first step is to complete the Free Application for Federal Student Aid (FAFSA) at fafsa.gov. When you complete your FAFSA, you’ll be considered for a variety of state and federal financial aid programs including loans, grants, and work-study positions. Our school code is 003050. We further analyze the results of your FAFSA to develop a financial aid package meant to decrease the difference between total cost of attending and your expected family contribution. 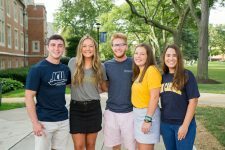 You can begin filing October 1, and we encourage completion by November 15 to receive notification of your total JCU award as early as possible. To find out your eligibility for financial aid and estimate your out-of-pocket expenses, use our interactive net price calculator at jcu.studentaidcalculator.com. JCU is one of 36 schools nationwide and the only Ohio school singled out for a Pell graduation rate 10% higher than our peers. JCU is the only school in Ohio with a zero percent gap in 4-year graduation rate.